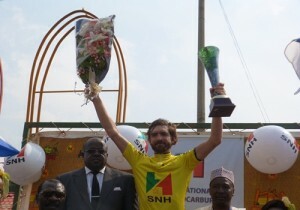 Started on March 9, the tour of Cameroon ended on Tuesday with the coronation of Dan Craven. The Namibian has completed 1,045.6 km in 28h05’18 sec averaging 37.39 km / ha in the overall standings ahead of the Swiss Atauder Benjamin and Dutch Patrick Kos with respectively 6 and 9 seconds. The Ivorian Issiaka Fofana occupies 4th place before the first Cameroonian Kamzong Abossolo, ranked 5th. 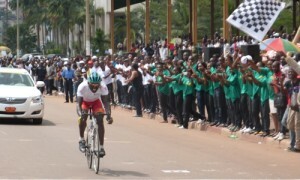 At the end of the eighth and final stage, the Cameroonian Ghislain Sikandji (in picture at right), who crossed the finish line first after a run of 119.7 km between Bafia and the capital Yaounde, beat Herman Yemeli Pichelle and Clovis Kamzong Abessolo. Dan Craven therefore wins the 11th edition. The Namibian succeeds on charts the Cameroon Yves Ngué Ngock winner in 2012. Outside Cameroon, Burkina Faso, Republic of Congo, Côte d’Ivoire, Gabon, Senegal, Germany, the Netherlands, Slovakia and Switzerland took part in this tour of Cameroon, registered in the calendar of the International Cycling Union in category 2.2.